Some days ago I have reported on the decision of the EU to remove the Iranian opposition group PMOI from the EU's terror list. Now, wondering through the endless stream of Council documents, I have found a document titled "Outcome of Proceedings of the CP 931 Working Party meeting held on 8 January 2009" which looked so strange that I needed to have look into it. Without mentioning any names, this document summarises the decision to take of PMOI from the terrorism list. And it indicates (taking into account previous discussions where the UK objected) that most probably the United Kingdom might have abstained when it came to the vote on this matter, showing that despite the decision of the Court the UK would not have been convinced it was wrong. PS: And just out of curiosity I learnt that the CP 931 Working party is the "Working Party on implementation of Common Position 2001/931/CFSP on the application of specific measures to combat terrorism" (the terms of reference of this working party can be found here). Chose your favourite logo, scroll down, chose the right number, and then vote! PS. : I opt for the first logo, because it's the only one that combines both national and European colours without being too abstract. According to a press release of the Organisation for Security and Co-operation in Europe (OSCE), the presidents of Armenia and Azerbaijan have met on Tuesday to discuss further steps of the settlement of the conflict over the breakaway region Nagorno Karabakh. This is the continuation of the positive developments reported in November, but the content of the press release does not look like any major steps forward have been made - not mentioning any concrete steps sounds like diplomatic stalemate, although it is already a success that both countries meet on their highest level. Georgia's scattered political opposition gathered Thursday to demand the resignation of President Mikheil Saakashvili and called for early presidential and parliamentary elections. [...] The declaration Thursday involved the broadest coalition of opposition groups to date [...]. Looks like a very typical movement in semi-autocratic countries where confrontational democracy-imitating politics meets rather autocratic leadership. I am not sure that I find this very encouraging for the peace in the region; hopefully Mr. Saakashvilli will not use this to run a new confrontational course with its neighbours in order to re-produce the boost in popular acceptance he had last summer. Update: Read also my post on the EPP manifesto(s)! Some days ago I complained about the European People's Party (EPP) not moving with regard to their electoral manifesto. And woosh: Tomorrow, at 13.00 (CET - or BT [Brussels Time]) the EPP will do its first incredible move and present its draft manifesto during a press conference. On the other side, Greens or Liberals say that they cannot really afford such a platform - but honestly, it doesn't seem like a big problem to me. This MonologueTV looks very shiny, but not very innovative. It's video in good quality, not more and not less. The full DialogueTV page is now online and it looks a bit more interactive than the version from yesterday. In fact, when you enter the website of the EPP (http://www.epp.eu) it redirects you to this DialogueTV page which is designed as campaign page. There you can find the draft manifesto in a short version and in the full version. I will comment on these texts in one of the next posts in this category. This week, the Parliamentary Assembly of the Council of Europe (uniting parliamentarians from 47 countries of the European continent) meets in Strasbourg to debate different pan-European issues. After a rather pessimistic speech of the Secretary General of the Council of Europe on Monday, complaining about the lack of funds for the Council of Europe and its European Court of Human Rights, debates about the war between Georgia and Russia and discussions about the International Criminal Court and the regulation of media, the Assembly tomorrow will discuss electronic democracy. I did not have time to go through the comprehensive report, including a resolution (directed to the 47 parliaments) and a recommendation (directed to the 47 member states), but those of you interested should watch the debate tomorrow on live broadcast from 10 a.m. But I have doubts that the parliamentarians will show much interest in this, because first of all it is Friday (time to travel home...) - and the report (as far as I could read) does not seem very innovative but rather like a stocktacking of developments from the perspective of somebody who does not completely understand the opportunities (and true risks) that electronic means offer to a modern democracy. In an interview with EUobserver, Graham Watson, leader of the Liberals (ALDE) in the European Parliament, and their candidate for EP president, has said that he hopes that his group will have at least 100 seats (=13.6% of all 736 seats) after the 2009 elections, equalising the score of the last polls (103 seats = 13.1% of all 785 seats). Sounds rather modest for someone, who wants to be EP President, doesn't it? On the Technicum, Kevin Kelly - if I understand it correctly - openly writes a book about the evolution of technology, about the development of the Earth machine, the technological evolution of the planet: The Technicum. What is the most important thing the European Union needs to work on? Democracy and human rights in its neighbourhood and beyond? After fooling around the European Court of Justice for some time (see my article from October 2008 on that matter), the Council of the European Union has finally decided to remove the oppositional People's Mujahedin Organisation of Iran (PMOI) - without discussion, as EUobserver reports - from the EU' terror organisations list. This is the first time that an organisation was taken off the EU's terror list. Does this mean that the evidence brought forward by the United Kingdom in October was wrong? That the member states purposefully ignored a judgement of the European Court of Justice although the "new" evidence was not strong enough to support this position? That the United Kingdom brought false evidence? That the member states don't care? Or does it mean that the member states in the Council just listen to the Court when they deem it politically appropriate...? In an interview to EUobserver, the secretary-general of the European Peoples Party (EPP) Antonio Lopez-Isturiz is very confident that the EPP will keep its majority in the European Parliament after the 2009 elections, although expects losing several seats. In contrast, the European Peoples Party seems to be the only major European Party that is not very interested in the European elections, because until today no hint to the elections portrays on its website. The EPP will also wait until its congress on 29-30 April Warsaw until it will adopt its manifesto, something other European Parties have already done (see discussions in this blog). This means that the self-confidence of the EPP relies on its national orientation, on its vision to win the seats not by a true European campaign but by simple votes for its national member parties. This fits to the attitude of the President of the European Commission - Mr Barroso - whose lack of enthusiasm, charisma, and European spirit reflects the behaviour of the EPP. I am disappointed, not least because great Europeans like Juncker are members of the EPP family! Update: The manifesto has been published and I have discussed and compared it with other manifestos. The Centre for Innovation & Entrepreneurship of the University of Karlsruhe is looking for two co-founders for a startup to develop an online encyclopaedia with articles of 140 characters length that would fit the length of messages in Twitter - which is why the project is apparently titled "Twitty". I think I will continue with this exercise in the future; if you have good ideas please contribute! In fact, the site has been quasi-online already for some time in its alpha version, so the surprise is not so big and the design has remained more or less the same over the last months. Nevertheless, the fact that almost 300 European blogs in different languages have been compiled means that this is the largest aggregation of EU and European blogs I know. In addition, a team of editors will chose the most interesting posts of the day and publish them on the front page of the portal, easing the choice for readers who are new to the EU blogosphere or who do not have the time to follow all the blogs at once. I hope that through this tool, the interest in the EUropean blogosphere will raise, especially ahead of the European Parliament Elections this year! The Council has published a nice little document summarising the main topics it has discussed in its different compositions since the end of November 2008. One headline plus one paragraph for each topic, all in very unbureaucratic language. It's worth a read. I like to see Council documents that give an idea about discussions behind the scenes. Today I found a document (published now, but issued in November) for the "Multidisciplinary Group on Organised Crime" in which discussions for setting up a "Single Point of Contact for Comparable Statistics on Crime" are summarised, indicating also the positions of member states. [O]ne of the obstacles to producing comparable crime statistics at EU level was the absence, in many cases, of a single point of contact in the Member States, capable of meeting the various requests with a view to providing the necessary statistical data, regardless of whether those requests came from the Commission, Eurostat, Europol, Eurojust, or other international organisations. In many cases, that meant delays in dealing with questionnaires and requests, duplication and difficulties in collating data dispersed over different ministries and administrations. In other cases, points of contact did exist, but there were just as many ministries affected by this horizontal problem (Ministry of the Interior, Justice, etc.). So now the question is whether member states want to set up one supranational contact point that would unite European statistics on crime. We learn for example that Germany is the only country that is against the proposal, apparently because of its internal federal structure. Belgium and Latvia have some hesitations, inter alia because they see difficulties in actually producing comparable statistics. Nevertheless, most countries having replied see room for better co-ordination and thereby more efficient information flows and economy of resources through such a unified contact point. Altogether, discussions seem to be very premature, but we get at least an idea on what level and with which arguments member states are discussing. At the end of the document, we also get a list of some national contact points for crime statistics, which might also be useful for some. Remark: I have started to write this article over a month ago and for some reasons never finished it. But I wanted to publish this as a fragment, at least. I have promised some time ago to provide you with a number of interesting insights coming from the Journal of European Public Policy, Number 15, Issue 8 (December 2008) which is dedicated to European party politics. Not all of the articles have proved interesting or providing results that are worth mentioning. I had hoped that this issue would be a bit more fruitful, but especially regarding the amount of empirical (= real-life) findings is quite limited. The first article,"Party politics as usual? The role of political parties in EU legislative decision-making" by Björn Lindberg, Anne Rasmussen and Andreas Warntjen concludes that there are some hints that transnational European parties play a role in the European Parliament, but that is quite early to conclude on their true importance. "[B]oth the EPP-ED and the Party of European Socialists (PES) group appoint rapporteurs with policy preferences close to the median position of their party groups" (p. 1117). "In cases in which the EP rapporteur and the Council Presidency belong to the same party family, the chance of concluding early in the legislative process is increased" (p. 1120). "[T]here is a clear, although weak, tendency of ideological coalition formation in the Council. Centre-left governments are, on average, more likely to vote together with other centreleft governments than with governments from the centre-right. Furthermore, when a new government enters the Council, it often finds that its closest coalition partners are not those of the previous government’s if the government change also meant a change in party political platform" (p. 1206). Open Europe reports today on something that the European blogosphere (not just me) has started discussing four month ago. The Register of Interest Representatives of the European Commission, which was having a slow start, has now suspended the registration of one lobbyist - GPlus (which was lobbying for Russia during the war with Georgia and on which I have reported before in the case of Peter Witt) - as Brussels Sunshine reports. "wishes to let citizens know which general or specific interests are influencing the decision-making process of the European Institutions and the resources mobilized to that end." We uploaded our entry on the European Commission's register on 15 December 2008. Our entry remained publicly available until 15 January 2009. The European Commission then removed our entry. They gave us no advanced notice of this. When we discovered our entry had been removed we contacted the Commission immediately. The Commision official responsible explained that our entry had been removed because 3 (out of a total of 39) of our clients had not been named. These 3 clients did not wish to be listed in our registration. We are actively trying to resolve this problem with the Commission. In the meantime, our entry on the register will available on our own here. Let's see, how this matter evolves. The European Parliament has put up a sub-page of its website covering the 2009 European Parliament elections. It rather looks like an acquittal than like a true enthusiastic offer to the European citizens, and I suppose that if it remains like it is today, it won't raise much interest. "[b]y voting in EP elections, [we] choose who influences [our] future and the daily life of close to 500 million fellow Europeans." If this was true, there would be more professionalism behind the page where you find this over-optimistic description on the task of the European Parliament. If this was true, you would not need to write it down. If this was true, there would be a natural interest in the elections. But it is not true, and the low ambitions of a sub-site are a very good indicator thereto. I recommend reading: "2009 and the EU budget: part one"
"2009 and the EU budget: part one"
I recommend reading - and following the whole initiative! If I read the agenda of this Wednesday's COREPER meeting (part 1) correctly, the Council of the European Union is going to authorise the Commission to extend the scope of the relations between the EU and the two mini-countries Andorra and San Marino. I cannot find the respective documents, and they don't seem to be public because they are marked RESTRAINT UE (which, according to a Council decision from 2001 means: "This classification shall be applied to information and material the unauthorised disclosure of which could be disadvantageous to the interests of the European Union or of one or more of its member states."). I suppose that this will largely be with regard to economic relations - but I will come back to this issue as soon as the documents are made public. Discussing with a colleague this morning, I said that Obama's national and international reputation is on its peak today, so if he can do something positive, inter alia for US-EU relations, than now is the time. My colleague was rather sceptical about the international profile of Obama, saying that he will have to focus to build larger national coalitions in order to get things done at home. Therefore, his influence on international relations might not be as big as his image is. Nevertheless, we were both convinced that Obama will never be able to stand to the expectations put into him, and that today will be the end of Obamania - tomorrow will start the real life. On their main website, they are now providing a banner-link - not very well distinguishable from the rest of the page and without the important date 2009 - to their campaign website where you can find their manifesto called "A Green New Deal for Europe". In fact, until now there is only the summary of the manifesto, which is why I won't discuss it now. What we learn on is that the Greens will start their campaign on 27 March 2009, during their Council meeting. And there is also a "blog" which until now has no RSS feed and contains only one post from 10 December. Altogether, it pretty much looks like work in progress, and we will see whether until the official start of their campaign this site will be more interesting than it is now. PS. : The European Peoples Party (EPP) still does not have any hint to the 2009 elections on their website. Damn, I still have 20,000 Euros on this travel costs budget line of programme XYZ - and since I cannot transfer them to another budget line, I have to find ways how to make people travel around in order to be able to spend that money before the programme finishes! This kind of attitude makes me really angry: People working for an public organisations and are using public money are looking for ways how to get rid of this money just in order not to have anything left. It shows an absolute lack of understanding about what kind of money they are using and spending. It shows that the incentive system build into some public (national or international) organisations is totally wrong and contributes to excessive spending and especially miss-spending of resources that could well be used for better purposes. Not to talk about the doubling of work of certain organisations without producing better results. As one of the last countries (including Ireland where the Treaty has been rejected by a referendum and the Czech Republic, holding the current EU Council Presidency), Germany has not yet ratified the Lisbon Treaty. On 10-11 February , the German Constitutional Court will hear five cases against the ratification of the Treaty issued by different complainants, including members of the German Bundestag (the parliament). Afterwards we will know if the Treaty is unconstitutional and incompatible with the German Basic Law, or whether - which I expect - this Treaty is not so much different from previous Treaties that it will be approved by the Court as those before. Just a short notice: Since the beginning of this year, I get a raising number of visitors and page views from people (mostly from Brussels) looking for information on the European Parliament elections, in particular via Google-searches for European Parliament candidate lists. First of all, it seems to be a good sign that there is at least some interest in the European elections, although the figures we are speaking about are still very low. Second, the search for candidate lists of all countries is still not bringing good results, because some countries like the United Kingdom already have (to a large extend) decided upon their lists and candidates, while other countries (e.g. Germany) still are in the selection process. I will, at some point in time, try to get a good overview over all lists, parties, and candidates, but today I have limited myself to present the UK lists, because I knew that they were ready and that they were well compiled on Wikipedia. But if in your country all the lists have been determined, please inform me, and I will try to link them! I also suppose that some of the larger platforms (see the sidebar) will do this, so I might use their collective and more professional wisdom if I can. O yes, folks, he has done it again, this Mr Jon Worth, the German-speaking, inline skating British social democrat who thinks that there is no god but Barroso: He is attacking the authorities! 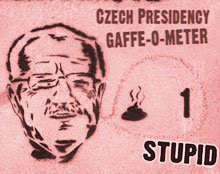 Look what he has done: A Czech EU-Council-Presidency gaffe-o-meter! I think that this is outrageous, he is proposing bloggers to use it when they write about yet another faux pas of the present Council Presidency! Outrageous! 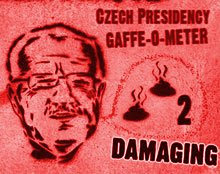 Don't use this gaffe-o-meter, because it will harm the Czech Republic, the European Union, your blog, the whole euroblogosphere! Don't use it!!! Somebody from UNICE (aka BUSINESSEUROPE) earlier today came to this blog looking for the COREPER meeting on 23 December 2008. Sorry, I didn't cover this one. I wonder what agenda point s/he was interested in...?! In its report calling for more transparency of the EU institution agreed upon yesterday (now published in a provisional version [1 MB doc-file; from page 160]), the European Parliament expresses concerns over the Draft Council of Europe Convention on Access to Official Documents. This is a good sign of interaction between national parliaments (represented in the Parliamentary Assembly of the Council of Europe) and the supranational European Parliament, and it shows that the concerns expressed by national parliamentarians are also shared by MEPs. The member states of the European Union (and all the other 20 represented in the CoE) should therefore take due note of the concerns expressed by our elected legislators, both national and European! According to the FAZ, the German Left, whose leader is also the head of the European Left, will spend 3 Million Euro for its European election campaign in Germany, expecting/hoping to win around 10% of the vote. For a comparison: This is about 4 times the budget of the European Left in 2007 (published on their website), and 60% of the budget the German Left party plans to employ for Germany's parliamentary election in September this year. European Parliament listens to the blogosphere: More transparency of the EU institutions! I was very much impressed and positively surprised when I just read the EP press release stating that the European Parliament wants to foster transparency of the EU institutions and has issued a respective report. [T]he committee argued that Parliament must take the lead on transparency and should embark on a special action plan ahead of the 2009 elections, with more information on MEPs' activities, their attendance at parliamentary meetings - in absolute, relative and percentage terms - and on their allowances and expenses. which would make private initiatives to supervise the Parliament more or less obsolete. the institutions are urged to improve transparency of the procedures for comitology and for agreements thrashed out at first-reading of the co-decision procedure through "trialogues"
The full and final text of the report is not yet published (at least the there is no link available), but as soon as it will be available I will update this post. And although I am not sure whether the European Parliament is actually following debates in the blogosphere, this reports seems to reflect pretty much major parts of the discussions (which I would link if I had time) we are having regularly among Eurobloggers and which have remained unheard so far by the European institutions. There is some light at the end of the tunnel, I hope! According to a press released issued by the EPP-ED group in the European Parliament last week, their young Members of Parliament have met last week to underline the importance of networking. "A mutual understanding of the issues at stake and a continuous dialogue between national and European politicians will help us position ourselves strongly for the upcoming elections." This is their point: Young politicians should network, and this will raise the interest of young people in the elections. To underline the importance of the elections for the EPP (-ED), neither the party nor the parliamentary group show any signs on their main websites that there might be this "important European event" during this year. Bravo! Taking into account that young people tend to use the internet much more than traditional media, this clearly reflects the failure of the European Peoples Party - and its young MP/MEP network - to consider youth reality! I have to admit: I love that affair more than the actual piece of art! Freedom House has released its 2009 Freedom in the World 2009 Survey, and the map of Central, Eastern, South Eastern Europe and Central Asia (attention: 1 MB pdf-document) looks clearly divided, although this is not a big surprise. The most interesting cases are the "yellow" (partially free) states. Interesting to see are also the four separatist regions in Europe (excluding Kosovo...): Nagorno-Karabakh (in Azerbaijan) and Abkhazia (in Georgia) are rated partially free, while Transnistria (in Moldova) and South Ossetia (in Georgia) are among the non-free states (or quasi-states, in their cases). If you are as worried as me, join his campaign, send some money, so that he can organise his boat campaign all around the seas of the Union! Nosemonkey presents how the British might vote for the next EU elections. He announces that he might well not vote - rather astonishing for the most prominent British pro-European blogger. If the elections don't get - who will they actually get? The evaluation report for the work of the Joint Reseach Centre (JRC) of the European Commission has been generally very positive. JRC publications hold a wealth of knowledge that should be easily accessible to theexternal public; the only acceptable exception to open publication is an issue of EU or national security. [...] [T]he organisation needs to use the most advanced Knowledge Management facilities. It is of utmost importance that science financed by public money is also publicly available. I think that this recommendation is therefore of high importance and, although hidden in the midst of 14 pages of the report, should be taken into due account. The definition of "national" or "EU interest" should also be limited as far as possible when it comes to scientific research financed by Community money. And the organisations should, as recommended, in proper knowledge management systems in order to make the findings easily accessible to the public. Altogether, the reports reads, as many others, far too general and bureaucratic, but the tone is rather positive and it raises hopes that the Joint Research Centre works properly. Since I have already taken first look at the Party of European Socialists and the European Liberal Party and neither the European Green Party nor the European People's Party show any particular sign of interest in the 2009 European Parliament elections on their websites, let me take a look at a party not yet covered under this category: The Party of the European Left. Uniting 20 of what could be called the "leftish" or radical left and communist parties of the continent, the European Left is a rather unnoticed political movement. In the European Parliament, they form an alliance with the Nordic Green Left and are called European United Left/Nordic Green Left, holding 41 seats (around 5.2% of all seats), which gave them roughly half a million of Euros of financial support from the European Parliament in 2007 (according to their public financial report). [T]he neo-liberal foundations of the EU treaties are called into question, in particular the insistence on an “open market economy with free competition”: the unchecked free circulation of capital, the liberalization and privatization of public services, the status and mission of the European Central Bank. The EL competes against conservative and liberal, social democratic and green parties in the member countries and with the corresponding European political parties, which are sticking to the logic of current European policies. The EL is striving for change and regaining the political space in Europe. The EL confirms its consequent struggle against any attempt by extreme right and right populist parties to broaden their influence in Europe. We strive for a substantial review of the EU Common Agricultural Policy (CAP). It must be directed at the right of people everywhere in the world to decide on their agricultural policy themselves by fully respecting the environment. [...] This means giving priority to local agricultural production, quality food and no constraints on submitting the products to the world market. The access to land, seeds, water and credits must be regulated in a real land reform in Europe and the other continents. The bilateral European Partnership Agreements are the wrong way. The international trade policy of the EU is to be measured by giving adequate answers for solving global social and ecological problems. The fight against still growing global poverty and imbalances must be put at the focus of development cooperation – the misuse of development cooperation for continuing a kind of colonial relations, for the one-sided support of export industries in favour of European enterprises, or as a geopolitical instrument must be stopped. The European Left favours the creation of all political and economic conditions for a peaceful coexistence of the European peoples and states. Europe needs an economic and social space which does not exclude any European country and which is based on a varied bi- and multilateral system of agreements. The EL stands for the further enlargement of the European Union and for a stable All-European structure to overcome still existing political and economic divisions in Europe. For that the EL supports in particular the preservations of democratic governance, of guaranteeing and realizing human rights for all people in daily practice, of respecting and protecting minorities and the state of law as important preconditions for negotiating with countries applying for EU membership. The EU itself must be made politically and economically ready for further enlargement steps as well. It's a pitty that this paragraph stands in the midst of quite controversial and sometimes even contradictory statements, mixing radicalism and pragmatism, idealism and strange realism, and producing a mélange that tastes so bittersweet that you don't know whether they would like to govern or just to destroy the system. Altogether, the text of the platform/manifesto is quite voter friendly. It could have got slightly more structure. But in total, apart from the content, it looks and reads better than the manifestos of the ELDR and the PES. It is entertaining, whether you like it or not. It is not too short, and not too long. And what is important for politics: You can read everything and nothing into many parts, giving room for national interpretations, without losing the general direction. In this sense, it looks like a rather professional text. I could go into more details, but this post would become far too long. What I like with the European Left is that they care for the elections, more than some other European parties seem to care. I also like their website, structured, but not too playful. Through Les Coulisses de Bruxelles I learned that the Czech EU-Council Presidency fascinated the international scene with another major PR mistake - or as we have called it before - amateurism - when they twice called Vladimir Putin "President" (instead of "Prime Minister") in an official Presidency press release. The respective press release has been corrected afterwards, but not quick enough to remain unnoticed. I could just find an extract from the original text under the Google search results where at least one of the "President Putin" references is clearly recognisable (see picture below). I hope that this is not the way the Czechs want to continue. I know that they might be understaffed - in fact, some time ago, one Czech diplomat, who I met during a private event, told me that they were afraid that they might have to do all the extra work within their mission without any extra staff (but as far as I could see recently, the fears were proven wrong) - but this is not an excuse. A Presidency that makes small but important mistakes like this - taking into account that it represents all 27 member states of the Council - might soon become a less credible partner, internally and externally, which will weaken the Union as a whole, no matter if the Czech attack dog President Klaus remains quiet when more important people show up. Okay, in her article for the Berlin-based newspaper Der Tagesspiegel, journalist Tissy Bruns does not call Vladimir Putin a "bumpkin". These days, the TV allows us to throw a glance at a Russian Prime Minister who acts in public as if he has never had a mother telling him how to behave in the presence of women. In other words: The way Putin acts is the typical standard male behaviour, showing off his maleness, his power, his ignorance of women as equal partners. Between Putin on one side, and Bush, Schroeder, Sarkozy on the other, there is a subtle distinction which Western democracies require from their politicians while a guided democracy à la Russia doesn't. [...] What makes this subtle distinction? In the democratic public space, women hold power; in Russia they don't. I think this is largely optimistic when it comes to the role of women in Western democracies, but I would not object to the interpretation when it comes to Putin's behaviour. During this week, a "NO TO LISBON" appeared in the snow in front of the European Parliament (and changed into an almost unreadable YES later on. In a comment to this article, Adrian Moraru who is working at IPP on the "How active is your MEP"-project informs that they have secured funds and that it will continue its work. Last month, EurActive told that IPP's "How active is your MEP", a very valuable tool I have discussed in August, might well be closed in the near future due to funding problems - which would be a pity, especially before the European Parliament elections. "Our VoteWatchEU project will provide updated information on all 785 MEPs’ voting records, presenting details on how they have voted within various policy areas. In a nutshell, VoteWatchEU will make it possible to look up one’s local MEP and see what he/she stands for, get various rankings for the most pro-/anti track records within the different areas, and find out when and how coalitions form between different political groups or between specific nationalities. All of this happens on the basis of a multi-sponsor approach, whereby a network of interests and expertise provide the necessary professional input to develop a highly sophisticated website and related activities. Also, since this project is closely linked to a number of national capitals, particular interests either in the Brussels ‘bubble’ or in national politics will not able to affect the content of the project." If this project will work out, I would be more than glad to use it, although it is quite typical that one very good initiative like the Romanian "How active is your MEP" will be replaced by a new initiative, instead of combining activities and funding in order not to double work, not to waste time and money, and in order to focus attention to one single project. Nevertheless, I am looking forward to votewatch.eu, because if it works, it should add to the transparency of the European Union and its parliament - and there is never enough transparency of democratic institutions! Thanks to the Child of Europe, the Anyone but God! Anyone but Barroso campaign gets more attention through a bus campaign with an atheist message. In the world' shortest press release the Czech EU-Council Presidency informed the world that Czech Prime Minister Topolánek spoke to Barack Obama on the phone. The call must have been so impressive and overwhelming that the press service had no idea what to write about. They don' see the chance to get the post of the President of the European Commission. But now they have found something new. The Alliance of Liberals and Democrats for Europe (ALDE) in the European Parliament has announced in a press release that it wants its group leader Graham Watson to become the next President of the European Parliament. In fact, this is truly the only major EU post that is exclusively chosen and elected by the European Parliament, so there is some sense in running for this post. It is also the only realistic chance for ALDE to get a major post at all. But who is this Graham Watson? I have to say that I saw him some two years ago during a conference in the European Parliament, but he did not leave a particular impression on me, which might not be his fault since I was in a rush and he seemed in a rush, not the perfect occasion to leave an impression. I think I have seen him at another event somewhere in the Union, but I don't remember him particularly. He is English (i.e. British). He is in the European Parliament for 15 years (three periods). He has some kind of blog and some kind of videoblog (also published on Youtube). He was the Chairman of the EP's Committee on Citizens' Freedoms and Rights, Justice and Home Affairs. I think that is enough about him. He has not been particularly interesting for the European public, I suppose, but he's better than nothing. The youth wing of the European Liberal Party (called LYMEC) not surprisingly supports this initiative, especially since they have demanded a personalisation of the European election process. To be honest: Watson's chances are pretty low, taking into account that the Socialists and Conservatives (i.e. the PES and the EPP) will most probably make the same deal as last time sharing the position of the EP president between these two major groups during the next five years. Yet, Pat Cox proved that it is not impossible for an ELDR politician to get into this position, so campaigning for Mr Watson is at least a sign of some kind of ambition. Nevertheless, it is rather a lack of ambition by the Liberals not to put forward an own candidate for the next European Commission presidency, an opportunity lost at the last Congress of the European Liberal Party. Taking Mr Watson as candidate for EP presidency is just a small sign of politicisation of the European elections, not more and not less. The Czech EU-Council Presidency has presented a document called "Key Issues Paper 2009 - contribution from the Competitiveness Council to the Spring European Council" (update: revised version of the document) in which it outlines the priorities of the European Union to strengthen its economy. While most of the 11 pages contain general rhetoric including "the Crisis", "research excellence", "small and medium enterprises (SMEs)" blabla, the last page presents, under the headline "The external dimension of competitiveness", a paragraph that might surprise those who thought that the Crisis would change minds when it comes to free market policies. The external dimension of competitiveness remains of crucial importance. Open markets, both in the EU and globally, are key to ensure growth and jobs. Avoiding the trap of protectionism and overregulation, Europe needs to take full advantage of the realities of the emerging new international economic system, diversify relations and develop new opportunities for mutually beneficial partnerships around the globe. Approaches for achieving an ambitious and balanced result in the negotiations on the Doha Round should be explored with our global trading partners. I don't see any change in free market rhetoric, which underlines that the basis of the Union are, after all, the five freedoms (four in the treaties plus the freedom of knowledge) and the continued strive for an ever more integrated internal market. As regards the EU’s “constitutional” stalemate, the Czech government will – hopefully – not lead Europe to an ever-closer union, to a Europe of regions (instead of states), to a centralised, supranational Europe or to an increasingly controlled and regulated Europe masterminded from above. It will keep stressing its EU presidency slogan “Europe without barriers”, which means the advocacy of further liberalisation, removing trade barriers and getting rid of protectionism. That is both, an attack to the political dimension of the Union, while stressing its market dimension. It is another sign that the Czech president will indeed split the efforts of the Czech EU presidency and make the next six month the most problematic for the Union in the last decade. Those advocating for the end of "neoliberal" ideology will have to lobby as hard as those lobbying for a more political and integrated Union until the next European Council. Getting sick of eurosceptic blog trolls - Join the movement! This blogg has become an EU hate blogg (ok, i understand if you do not like EU) but also a Margot Wallstrom hate blogg…You people are sad… Haven’t you anything else to do than to pour your bile onto a woman that was appointed by her country to be the country’s commissioner in EU…? ?This is her job…. You may not agree with what she does or says but can you at least one of you, post anthing constructive in here….?? anything that it might make her or any other person that reads this, rethink some things and maybe even change something in EU….like all NO voters and supporters, when you are asked what should be the Lisbon Treaty including in order to be better, you reply nothing, you have nothing to say…just idiotic posts like the above “i hate EU” etc…. Get a life i advise you, and if you have any constructive critism to make please do, if you don’t then go and get some sleep…. I am disgusted by your manner of your posts, i am wondering why they are on display since EU is undemocratic and does not allow people to express themselves…Is that what you call undemocratic…?? how much more democracy do you want…?? EU is here to stay, get used to it, get over it..instead of fretting and going hysterical about it, better think ways to make it work better for all of us…EU is a political and should be a political organisation as well,not just a big bazaar for trade only…otherwise only market and multinationals’ rules and laws will apply to us all,and how can this be good..? ?…Europe should unite politicaly in order to deal with challenges that we are facing already or we will face in the future. I'd like to have more of that! Get angry about bloody euroscepticism, and fill the European blogosphere with constructive approaches to reform the Union. Let's start to reform Margot's blog, and then spread the message of hope all over the place. Come and join our movement, europhiles and eurorealists, eurohopefulls and euroreformists, euroenthusiastics and europrogressives, euromobiles and euroregionalists - come and join our movement! Since January, 1, Greece has taken over the chairmanship of the Organisation for Security and Co-operation (OSCE) from the Finns. Their foreign minister Alexander Stubb has been blogging several times during the Finnish chairmanship, notably during the Russian-Georgian crisis, which called my attention earlier this year. I doubt that Dora Bakoyannis, number 78 on the Forbes list of the most powerful women and first female foreign minister of Greece, will get the attention of the European blogosphere with extensive online appearance. In particular, we intend to proceed with a swift and co-ordinated course of action to try and find a compromise arrangement that would allow the Organization to continue its activities throughout Georgia, in order to assist all efforts for the peaceful resolution of the crisis. The last time we have heard about the OSCE was in early December, when the Russian proposal to establish a new pan-European security strategy was rejected by the rest of the OSCE countries. The only remark in the press release is that Greece will "build on the discussions" at the ministerial OSCE Council in Helsinki, which means that on the diplomatic level they cannot bury the initiative but it won't come up politically. The next OSCE presidency (2010) will be held by... Kazakhstan, a nation that ranks particularly low in all fields of democracy and good governance, according to the 2008 Freedom House "Countries in Transit" report. Oops, have I been deliciously tagged by Ms Bakoyannis personnally today...?